Our Monogram Boys Wall Sticker with Stars is a large monogram letter decal in one colour with your childs name in another colour. Comes with stars as well. Monogram Boys Wall Sticker in Jet Black, Grey, Dove Grey, Warm Grey, Light Grey, Snow White, Milk Tart, Sandy Toes, Nutmeg Forest, Choc Chips, Dark Roast, Bok Jersey, Lush Grass, Key Lime, Creamsoda Float, Aqua Marine, Topaz Ice, Cornflower Blue, Deep Sky, Azure Splash, Royal Wave, Navy Cadet, Purple Slushies, Lavender Bouquet, Pale Plum, Candy Floss, Raspberry Cerise, Rich Pinotage, Fire Engine Red, Naartjie Zest, Summer Sunshine, Matt Gold, Matt Silver or Mirror Metallic Rose Gold. The main photo is Snow White Main Letter with Royal Wave Personalised Name. If spaced like main photo, the small Personalised Name Sticker measures approx. 74cm x 56cm (h). The exact width and height of the name will depend on the number on letters (see below). Main Monogram Letter is only available in Roman Text and is a capital, max size is 57cm x 50cm but it will depend on the letter, e.g. the thinnest letter I = 28cm x 50cm, whereas the widest letter W = 57cm x 34cm. Most letters, however, will fall in the approx. 50cm x 50cm category. Personalised Name: choose from 10 Fonts, maximum 12 letters, case sensitive. Be aware that depending on which font you choose and that the longer the personalized name, the shorter in height the letters will be.The maximum width of whole name is 57cm so for example: in Kids Type – Sam will be 57cm x 31cm high, whereas Samantha will be 57cm x 13.5cm). – Main Letter in Roman Text (max size: 57cm x 50cm). – Personalised Name Decal (57cm across) – we recommend less than 12 letters. – 8 Stars in Name Colour (largest: 7cm, smallest: 4.5cm). – FREE: 6 Stars in Main Letter Colour (largest: 6cm, smallest: 5cm). This Monogram Boys Wall Sticker with Stars is perfect for boys or girls in fact! One amazing thing about these Monogram Stickers is that you can choose to position them as you wish. Take a look at the photo with the name Ethan: the initial E (main letter) and the name have been placed one underneath the other and the stars have been added to the main letter. 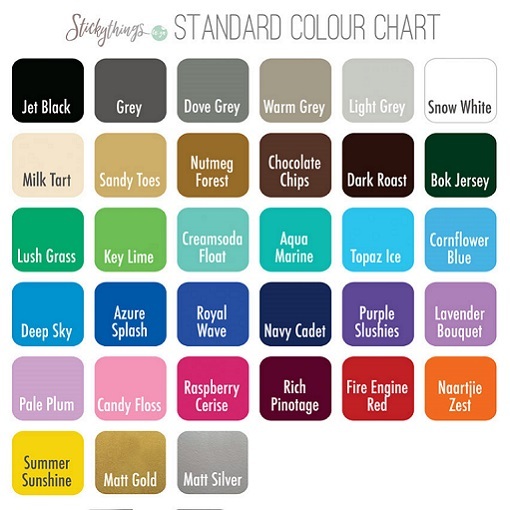 You can also personalise the name decal by choosing from our 10 fonts and 18 Colours. You can use this name decal with almost any of our wall stickers, although it goes really well with one of our Planets and Stars Themed Wall Art. And: Get 6 stars in same colour as the main letter (Colour 1) for free!